Dr. Max Grivno, assistant professor at the University of Southern Mississippi, is the 2010 winner of the Reed Fink Award in Southern Labor History. The subject of his proposed research is labor and civil rights in Mississippi’s Piney Woods, 1930-1975. Grivno joined the faculty of the University of Southern Mississippi in 2007 after completing his doctorate at the University of Maryland. While completing his degree, Grivno worked as a historian with both the National Park Service and the Freedmen and Southern Society Project, a documentary editing project whose work focuses on emancipation and Reconstruction. In 2008, Grivno’s doctoral dissertation was named a finalist for the Labor and Working Class History Association’s Herbert G. Gutman Dissertation Prize and the winner of both the University of Maryland’s Richard T. Farrell Prize and the Southern Historical Association’s C. Vann Woodward Dissertation Award. He is currently revising his dissertation—“‘There Slavery Cannot Dwell’: Agriculture and Labor in Northern Maryland, 1790-1860”—for publication. Grivno’s research and teaching interests include slavery, labor history, southern history, and the early national period. The Reed Fink Award, administered by the Southern Labor Archives, part of the University Library’s Special Collections and Archives Department, honors the contributions of professors Merl E. Reed and Gary Fink, both of whom were instrumental in the establishment, development, and use of the Southern Labor Archives at Georgia State University from the early 1970s. Grivno plans to visit the University Library in late summer to research the Southern Labor Archives. While he is here, he will also be presenting his research to the GSU community (the date of the presentation will be announced at a later date). Questions about the Reed Fink Award in Southern Labor History, the Southern Labor Archives, or the Special Collections and Archives department should be directed to Traci Drummond at archives@gsu.edu or 404.413.2880. 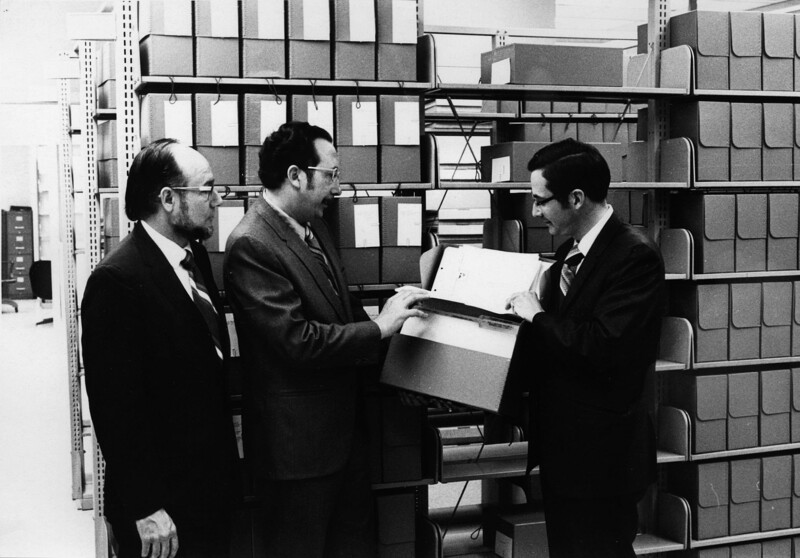 *The photograph shows Dr. Merl E. Reed, left, with an unidentified man (center) and Dr. David B. Gracy II, right, first archivist of the Southern Labor Archives, as they look at an early donation, ca. 1972. Courtesy University Archives, GSU Library. This entry was posted in Communication, For Faculty, For Graduate Students, General News, History, Sociology, Special Collections & Archives. Bookmark the permalink.